Here is an offer you may be interested in for the holidas through end of 2018. Any purchase with two or more of our Wall mounted ironing boards or mobile laundry centers or combo earns 10% off the posted price. Please call 800-739-7374 to order. *RTA - Ready to Assemble so there is less shipping cost to you, less packaging used, less dimensions shipped, and less chance of damage, than if it were pre-assembled. The Lifestyle Mobile Laundry Center is a high quality, space-saving laundry center on wheels. It Includes a full-size, folding steel-mesh ironing board (43 ½” x 15”), padded cloth cover, three slide-out chrome wire baskets, a slide-out laundry hamper, convenient iron rest, adjustable clothes rack, six wheels and a zippered storage cover. The Lifestyle Mobile Laundry Center is only 44” long when fully open and folds down to an amazingly compact 23” when closed. The Lifestyle Mobile Laundry Center offers a unique, compact solution for problem areas where space is at a premium. 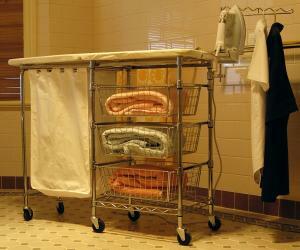 A conventional ironing board, storage baskets and laundry hamper can easily take up to 87 inches of space. However, the Lifestyle Mobile Laundry Center is only 44 inches long when fully open and folds down to an amazingly compact 23 inches when closed. The Lifestyle Mobile Laundry Center is also a very high quality steel unit with heavy chrome fittings, a powder-coated, ventilated, steel-mesh ironing board and six heavy-duty wheels. You will absolutely not be disappointed with the Lifestyle Mobile Laundry Center! A full size, foldaway ironing board: 43 1/2 in. long x 15 in. wide and 33 in. height. A specially made, padded, cloth ironing board cover that reduces movement while ironing. Three (3) chrome wire baskets that slide out to store freshly ironed clothes. A removable laundry hamper for holding ready to iron items. A fold out iron rest. Six (6) wheels; Two (2) of the six wheels are locking.